The ©Growing Deep and Strong Series is an intentional Christian discipleship and small group leadership path to quickly establish new and maturing believers in their faith. We have made it so easy you will wonder how you ever coped beforehand. We collectively spent over 35,000 hours to give you a complete-off-the shelf Christian Bible study discipleship and leadership course that you simply purchase and implement. ©Growing Deep and Strong will take a person from a pagan background to a Christian small group leader in 12 months or less. The ©Growing Deep and Strong Series is about changing and transforming the lives of people from the inside out. 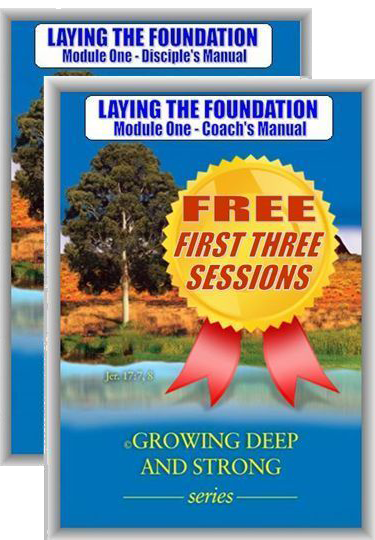 If you have proven leadership and management skills or have completed the Series as a disciple, then you can easily take others through ©Growing Deep and Strong by following the steps we have written into the Coach’s manuals. Is a 6 to 12 months off-the-shelf-mentoring Bible Study discipleship course that will grow a non-Christian into a mature Christian. It’s unique style is written in an easy to understand format to quickly establish Christians in their faith with minimal supervision through equipping and involving ordinary Christians in leadership. The ©Growing Deep and Strong Series consists of an Evangelism video and four nine-week modules, including two Encounter Weekends. The purpose of the four modules is to establish a new believer quickly with strong Biblical foundations, free disciples from bondages that they may bring into their Christian walk, help them to reach out to people they know and equip them to be a Coach and disciple these people. There are two manuals for each module, one for the disciples and one for the coaches. The coach’s manual has the complete presentation, filled-in answers, and questions for review and group discussion at the end of the session. in any location or time frame. It is simple to teach. It multiplies groups with minimal supervision.